Investment still lags far behind the United States, where venture capital firms are more established. Six weeks after Britain's vote to leave the European Union threw London's future as a leading global fintech hub into doubt, there are tentative signs the country's reputation for innovation in financial services will survive. From high in a skyscraper in Canary Wharf to Victorian warehouses around "Silicon Roundabout", some of the startups Britain has fostered to make its vital finance sector more efficient are less anxious than they were about the decision. "The first week was sad, people were confused and did not understand the reality of it all," said 28-year-old Daumantas Dvilinskas, who heads one of dozens of fintech firms crammed into three floors of the Wharf's One Canada Square tower. The start-ups in the "Level 39" Canary Wharf hub worried the surprise June 23 vote to leave the EU would cost Britain access to Europe's single market, shrinking their talent pool, putting off foreign investors and damaging the country's fintech status. Access to the single market remains key, and uncertain, since the government has yet to clarify what sort of agreement it will seek with the EU in talks that could take years. That has put many businesses into a holding pattern and made some, including in fintech, consider leaving Britain. But a series of startups in fintech, which owes much of its success to the global financial crisis of 2008-09, when people lost faith in banks and other financial institutions and sought alternatives, are already showing their adaptive mettle. Fintech, or financial technology, aims to "disrupt" mainstream banking and payments by offering cheaper and easier-to-use Internet or smartphone based services like payment Apps and peer-to-peer lending platforms or digital currencies like bitcoin. Several firms have closed funding rounds since the referendum, including online peer-to-peer lending platform MarketInvoice, based just off a traffic circle in London's Shoreditch district dubbed "Silicon Roundabout" in a downbeat British nod to California's "Silicon Valley". The company allows small firms to sell their invoices to investors and avoid a cash flow crunch from delayed payments. "Following the result of the UK referendum, many might perceive investing in fintech as a risk," said Sylwester Janik, a senior partner at MCI Capital, a Polish venture capital firm that has invested 7.2 million pounds ($9.5 million) in MarketInvoice. "We see an economic slowdown and a distracted banking sector as a potential opportunity to fuel growth of the platform." Santander InnoVentures, the Spanish bank's London-based fintech venture capital fund, said last month it was doubling in size, to $200 million. Mariano Belinky, a managing partner, said the idea of fintech firms leaving London in the aftermath of Brexit was "not reality". Lawrence Wintermeyer, CEO of fintech trade body Innovate Finance, agreed. "While people were in shock on (June) 24th, most fintechs are actually focused on the opportunity now," he said. "They're very innovative entrepreneurs, so they'll work around Brexit. If institutions are disadvantaged by things, those generally create opportunities for start-ups." He said it would be difficult to know whether funding had slowed down for the next couple of quarters but that he had heard of pre-referendum funding agreements with break clauses added in the case of a Brexit vote. On the face of it, Dvilinskas' firm's business model has been rocked by the EU vote, but he has no plans to leave. His company, transferGo, offers a cheap way for Eastern European workers in Britain to send money home via web browsers or smartphones; both immigration into Britain and its free access to other EU members financial markets are now in doubt. Dvilinskas, who built his start-up from a single rented desk chair to a 15-person office in four years, said the loss of so called passporting rights for UK-based financial services to sell across Europe would be a "deal-breaker", but is planning for a future here. "We have less risk tolerance and we are building up a contingency budget," he said. Innovate Finance reckons 30 percent of the sector's 61,000 workers are from overseas, with most from the European Union. 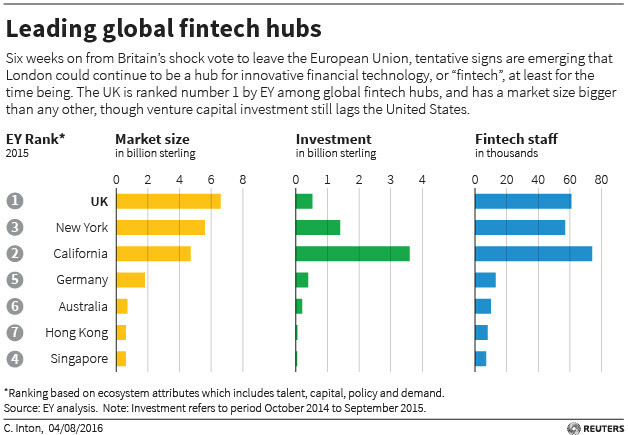 But it found in a post-Brexit survey that access to foreign investment was the area start-ups see as most critical to Britain's fintech status, with passporting seen as less vital for fintech than for bigger institutions like banks. Britain's fintech sector generated 6.6 billion pounds in revenue last year, global accountancy firm EY said in a report commissioned by the British government. It ranks the UK, effectively London, as the number 1 global fintech hub, based on market size, investment, workforce, light-touch regulation and supportive government policy. Others put London at the top of a European ranking. Investment still lags far behind the United States, where venture capital firms are more established. But entrepreneurs say a key advantage of Britain is that, while the U.S. tech and finance hubs, Silicon Valley and New York, are on opposite sides of the country, pretty much everything is in London. Closer to home, Berlin is snapping at London's heels for a share of its main market, Europe. The German capital's economics minister Cornelia Yzer visited London last month, urging start-ups to move to the "boomtown" city, where a new start-up is created every 20 hours. In the three weeks after the Brexit vote, 10 London fintech start-ups made enquiries about moving to Berlin, a business development group for the city said. But as in the United States, Germany's financial hub, Frankfurt, is a long way from its tech centre, Berlin, 540 km (340 miles) in the German case. And, cosmopolitan as it may be, English is not the main language. "There is no need to speak German," countered Yzer, adding that Germany's two biggest banks, Deutsche Bank and Commerzbank have operations in Berlin to combine the "fin" with the "tech". Dvilinskas cited efforts by Britain's Financial Conduct Authority to help firms find their regulatory feet as another strong plus point for staying in the UK. Eileen Burbidge, "fintech envoy" for Britain's finance ministry, says even limited access to the EU market would not be a "deal breaker" as firms could apply for licences. But some fintech firms are already asking about possible licences in EU member Ireland just in case Britain won't have access to the single market, Dvilinskas said. A delegation from Luxembourg's government has also visited Level 39 since the Brexit vote as fintech executives think hard about where to spend money in future. Dvilinskas said many firms were keeping their options open. "A lot of people are hedging, such as not buying real estate here, with everything on hold until there is more information."